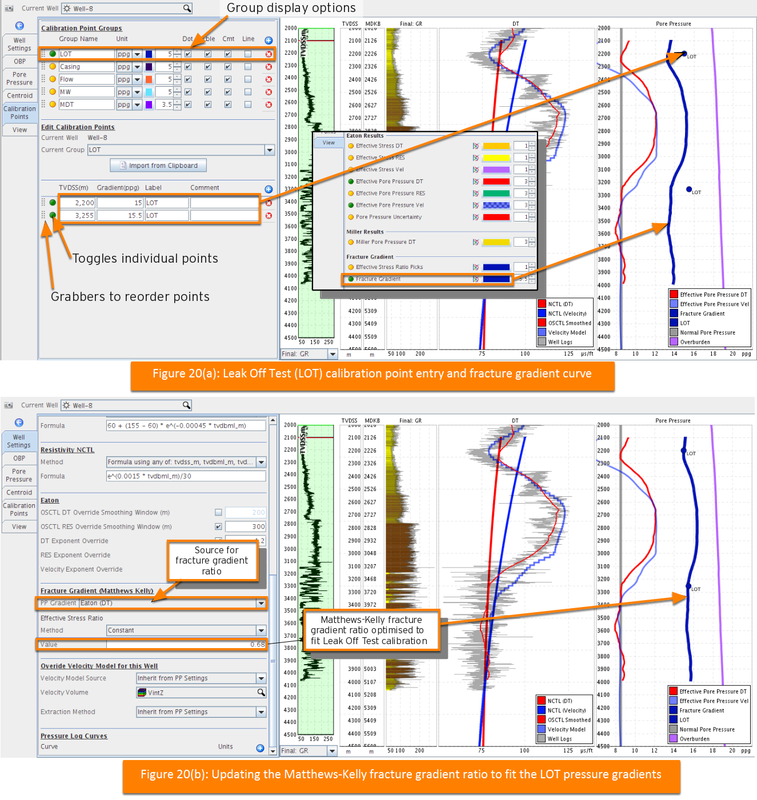 The pore pressure track can be annotated with relevant borehole data, such as MDT (modular dynamic test), LOT (leak off tests), mud weights, flow tests, and casing points. When there are only a few points, manual entry may be the simplest route. Leak Off Test points are a useful guide to calibrate the fracture gradient. In the Calibration points tab, Calibration Point Groups section, create a new group called “LOT”. Select the units in which you will enter points: either psi (pressure) or ppg/SG (pressure gradient). To add a row, click the Add icon (+) under Edit Calibration Points. Type the depth, pressure (or pressure gradient), and a label/comment as desired. These points may be reordered by dragging the handle on the left side of the row. Display options for each group (point colour, size) are alongside the “Group Name”. Figure 20(a) shows the completed LOT entries and their positions on the PPG track. The LOT can be used to calibrate the fracture gradient. The Matthews/Kelly fracture gradient is the ratio between the OBP (overburden pressure) and the PPP (pore pressure prediction), and is set under the Well Settings tab. First, choose a source for the pore pressure: the Eaton calculation, a log curve, or an interpreted curve. The methods for the OBP-PPG ratio are similar to the PPP methods described in Eaton's Method or Miller's Method - typically a “Constant” ratio is chosen. The “Value” (which defaults to 0.5) can then be updated to best fit the LOT calibration points, as shown in Figure 20(b). Note: Deleting a Calibration Point Group will remove ALL points from ALL wells. If there are many points, it is more efficient to add via the clipboard as shown in Figure 21. First, enter the pressures into a text or spreadsheet editor. Select the values and copy to clipboard (Ctrl-C on Windows or Linux, Cmd-C on Mac). 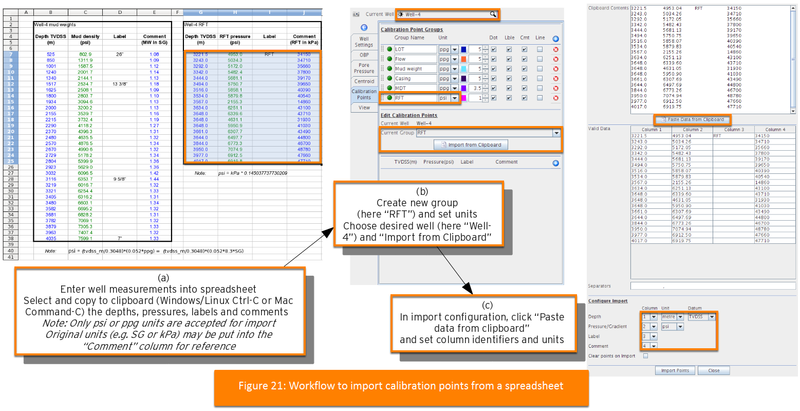 Create a new calibration point group, and select the units. Select Import from Clipboard to bring up the import configuration GUI. Points should paste automatically, but can be reset by clicking Paste Data from Clipboard. Up to 4 columns can be assigned. Click Import Points to add to the group for the current well. Note: Only psi or ppg units are accepted for import. With Mud Weight in SG or Pressures in kPa, these can be converted to psi using one of the equations from Unit Conversions section. You can create any number of groups. 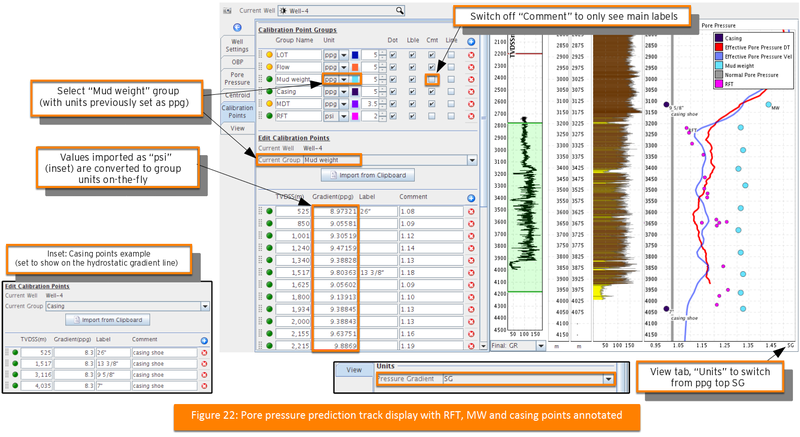 Figure 22 shows a pore pressure prediction track with RFT, MW, and casing points annotated. Note: For existing groups, the units are set upon the group creation. If points are added to that group, values will be converted to the group units on-the-fly. For example, mud weights imported as “psi” (see spreadsheet in Figure 21(a)) are automatically converted to the group units “ppg”. Although calibration pressure gradients may not be imported in units of specific gravity (SG), they may be viewed as SG using the view menu, Units option.